Let's start the new year with this rare and hard to find tape from 1996. 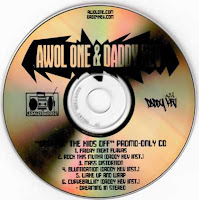 This compilation came out on Awol One's old label Broken Tapes/Records Broken, and features songs by Shape Shifters, EX2 (E Times Two), and Jizzm. All beats and cuts made by Awol 1 for Awolerus Productions, recorded live in the dungeon from a broken sampler.